A flavorful sea-faring Bourbon tasting twice its age. Jefferson’s was founded in 1997 by Trey Zoeller and his father Chet — a famed Bourbon historian who wrote the book on Kentucky distilleries. Yes, an actual book called “Bourbon in Kentucky: A History of Distilleries in Kentucky.” And eight generations ago, their great-great-grandmother was arrested for the “production and sales of spiritous liquors” in 1799. Which makes her the coolest ancestor ever! They acquire and produce a range of specialty Bourbons and Rye Whiskies. In 2007 Jefferson’s was sold to Castle Brands to build portfolio of premium spirits. The Ocean Voyage series was launched in 2012. Here’s the idea… instead of putting the casks of aging Bourbon in a stationary warehouse, they put them on a research ship plying equatorial waters. After three years of near constant motion in warm, tropical seas, the Bourbon takes on the characteristics of a much older Whiskey. And the using a wheat-forward mash bill (less rye grain) means a smoother, sweeter experience. The current release is “Voyage 15” and each release is limited to three award-winning barrels, served at a wonderful 45% ABV. OCEARCH was founded by Chris Fischer as a non-profit organization doing scientific research on great white and tiger sharks. His research vessel — the MV OCEARCH — serves as the aging warehouse for Jefferson’s Aged at Sea Bourbons. 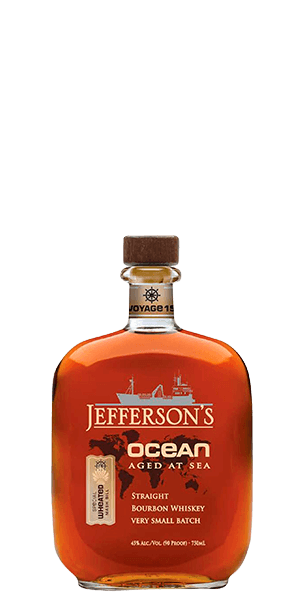 What does Jefferson's Ocean Aged at Sea Voyage 15 Bourbon taste like? The Flavor Spiral™ shows the most common flavors that you'll taste in Jefferson's Ocean Aged at Sea Voyage 15 Bourbon and gives you a chance to have a taste of it before actually tasting it. A light, warm spice and Cracker-Jack aroma fills the glass. Warm salted toffee, vanilla, and roasted sweet corn notes are abundantly displayed. The Bourbon has a smooth, almost glassy finish. Amazing! Salted caramel, smooth, vanilla notes. This one is unique! Really smooth with hints of vanilla and salted caramel. I love the fact you can taste the sea salt. Nice long sweet finish. Not a lot of spice, almost like the years at sea washed it away. Very enjoyable. This is my favorite ocean bourbon. Great caramel and vanilla notes from the wheated mash bill. Love it. Smooth Carmel and vanilla flavors. No burn. Great taste and smell. For a wheated Bourbon, this is much spicier and not as sweet as I would have expected. Definite salt notes on the finish, but in a rather pleasant balance and not at all overpowering. Lingering oak and vanilla on the finish. Clean and crisp for a Bourbon. The wheated was my favorite release of Ocean so far. One of my all time Fav’s. I am definitely a wheated bourbon fan so I bit the bullet on the cost of this one to give it a try. Definite salty vanilla caramel notes come through. Nice oaky finish. Overall it is a very nice pour. I still question the cost point of Jefferson's Ocean vs buying another wheated bourbon like Weller. I would really love to taste this in a barrel proof version! i.e.... regular Maker's Mark is just ok, but the Cask Strength is outstanding. smooth with not back after taste. in all not bad whiskey to buy. It's in my collection to buy again in the near future. Smooth and tasty. Great chew to it. Really wanted to dislike this because it seems like a lot of marketing hype. Fortunately, it really does work and you really can pick up a bit of salinity in the finish. All in all it's a good bourbon and worth the money if you can find it discounted. The wheated quality is reminiscent of Buffalo Trace and Old Weller. It’s smooth, sweet, and delicious. A really really smooth bourbon. Really like this, got it based on reviews. Had a unique taste and aroma to me. Beyond phenomenal! I just bought my third bottle! I can’t get enough of it! The flavor notes are exactly as described. We (people in the distribution business) had a sample party with my last bottle - everyone loved it! Get this bottle and drink it neat! You won’t be disappointed! New to Bourbon but have drank a lot in the past including Weller's Special Reserve, 12 Yr, and 107, and can honestly say I like this the best. Smooth, lots of flavor that lasts long on the palate, and no bite at all. I offered this at a tasting I hosted and it was well received. I found this whiskey very flavorful and smooth on the front end then boom a blast of salty ocean air on the back end! This one was fun! Jefferson's Ocean Aged Wheat Mash Single Barrel Select, 2018 is an outstanding, delicate, Whiskey from Kentucky. It has a rich birth with notes of vanilla, port & mash; while life adds hints of toasted rye, magnolia & marshmallow; that leads to a short & delicate death with hints of charred oak, mint & nut.